1. Starting with the best thing thats happened. I ran and walked for 40 minutes yesterday, 30 minutes Jogging in total which I thought was pretty marvellous. I did 3 minutes jogging followed by 1 minute of walking for 40 minutes, I honestly didn't think I had it in me but yep it seems I do. I think I may have got the bug. 2. I read a book for the first time in forever. I must have been in need of it as I read it all in one sitting. 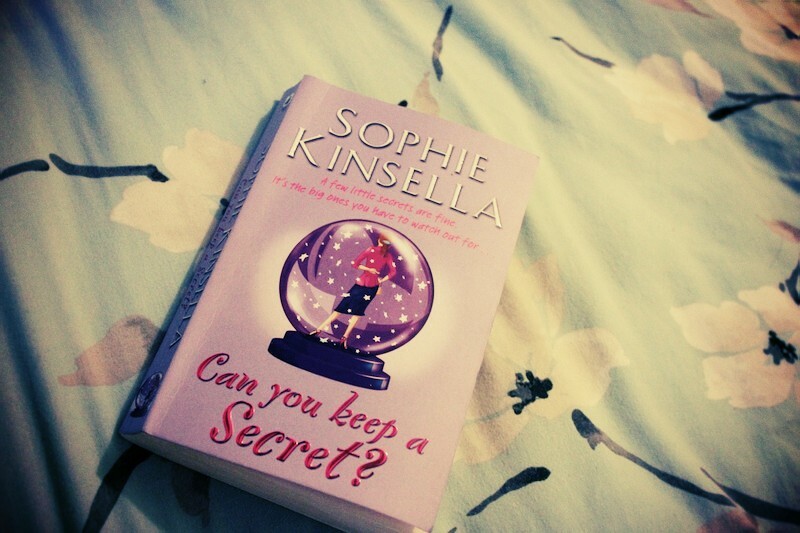 Ok Ok I confess I actually I stayed up until 4.30am reading Can you Keep a Secret by Sophie Kinsella. I love a good chick lit book totally non taxing and thoroughly enjoyable. 4. I've decided that wherever possible I'm going to only use photographs taken by myself for my blog. Occasionally in the past I've used WeHeartIt for some images and always linked back to the source, but to be honest its super duper difficult to link back to the actual photographer who took the photograph on sites like tumblr and WeHeartIt. Don't get me wrong I love the photographs on WeHeartIt but I love taking and creating my own even more. Where this isn't possible I'll use an image found from elsewhere (for example products I don't yet own or are lusting after from an online retailer) but will always link to the source where a photograph has been borrowed. So yeah just a heads up that 99% of the images on my blog from now on will be taken by moi. when i read i wanna feel good. thats why im not into "heavy" books - like dramas/crime etc. Really well done on the running :) I'm so useless; I get out of breath after walking up a flight of stairs. Really like that book! Have you read Remember Me? and The Undomestic Goddess by Sophie Kinsella as well? Absolutely love her books! I'm the same with magazines!! Nightmare! Well done on the running, must feel heaps better already? i LOVE that book, i read it in Sept whilst i was in Cuba ... LOVE the Bridget Jones Esque starter! Sophie Kinsella is probably one of my fave authors, wish I had the time to read more. 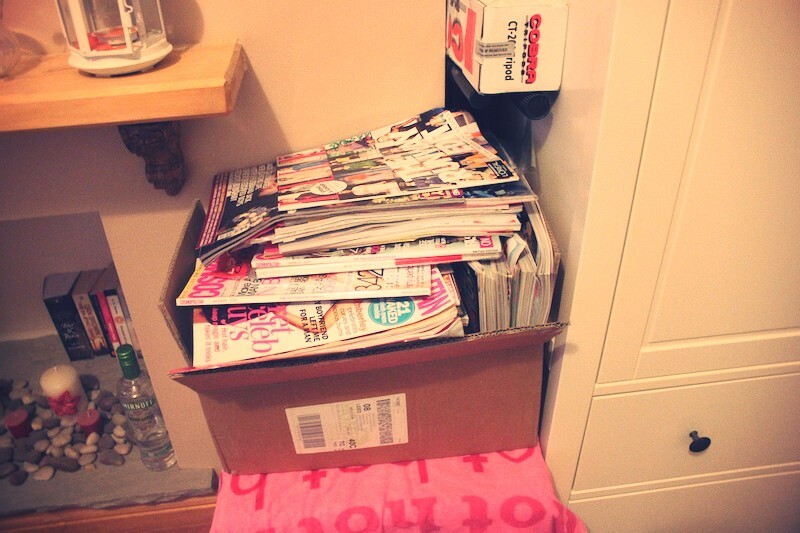 Oh how we all love magazines, why is it so hard to get rid of them! I usually go through them & cut out images I like too- not sure why, as of time I don't use it, but I find it inspiring. Love the Bridget Jones style post! Love your photos, can't wait to see more! I have a box the size of that full of magazines, why can I not bring myself to throw them away?!? The photos look really nice! I had a magazine clearout recently too. Don't know why I insist on hanging onto piles of Look mags! I've only just switched back into normal mode after the festive season. I just loved slobbing about in comfy clothes eating quality street ha ha. It's cool you managed to go for a run, it's quite easy as well to kind of go all out and do too much when you get back into exercise. You just end up getting put off because you're absolutely knackered. Easing your self back into it is the best way. Your magazine pile is HUUGE by the way. As for reading, it all depends on the book, if it's a good book then it's like crack you can't put it down you just want to read it at any given opportunity. I have read some books though that no matter what I did I just could not get into it. Those are a chore to get through.